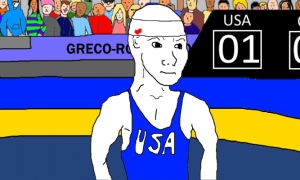 The first day of Greco-Roman at the 2018 World Championships, held at the Papp Laszlo Sports Arena in Budapest, Hungary, didn’t go so well for the Americans. All four athletes dropped opening-round matches and not one of them had an opponent who could pull them back in with chances to compete for bronze. Friday represented renewal. A new day meant new possibilities. Three of the country’s finest were set to do battle, and despite the challenging match-ups that awaited, optimism was high. 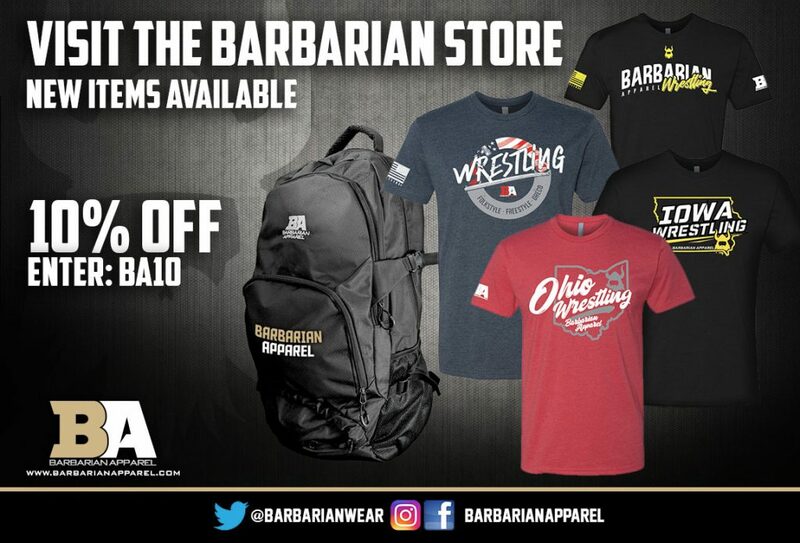 Unfortunately, Team USA is off to a similarly disappointing start on Friday, as Dalton Roberts (60 kg, NYAC/OTS) and Patrick “Lone Wolf” Martinez (87 kg, NYAC) both fell in first-round action. Day 2 of the 2018 World Championships began Friday morning at 10:30am local time (4:30am EST) and aired live in the US on Trackwrestling. There was no underestimating 2016 Junior World silver Etienne Kinsinger (60 kg, GER). 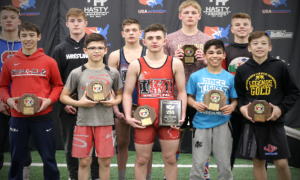 An explosive, experienced wrestler, Kinsinger represented a potentially difficult assignment for first-time Senior World Teamer Roberts right out of the gate. And if Roberts were to prevail, there were going to be other stout competitors he would have to face down later in the day, like Russia’s Sergey Emelin (world no. 4), Luis Orta Sanchez (CUB, world no. 1), or Uzbeki Firuz Tukhtaev. But the key was getting there. Roberts, the American fan favorite lauded for his never-ending pace, demonstrated multiple times throughout this, his most impressive season to date, that he possessed the temerity to face off with perceived World-beaters and make them crumble. That is what you wanted to see from the babyfaced Northern Michigan standout. You still might. It just probably won’t come at the 2018 World Championships. 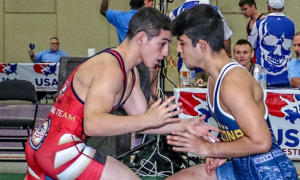 On Day 2 of Greco-Roman action in Budapest, Roberts and Kinsinger engaged in a qualification round match-up that started off in the manner most would expect, Roberts diligently working to plow forward and attempting to walk down his foe. An overeager Roberts had a miscue midway through the first. He tried latching onto Kinsinger’s head and arm, and when he did, the compact German responded by locking around the body. Roberts conceded the position and went prone, resulting in two points the other way. Kinsinger then clamped on a gutwrench and rolled Roberts twice for a commanding 6-0 lead, and that’s where it stood entering the break. Roberts didn’t appear too concerned as the second period got underway. The six-point deficit, while perilous, could easily be made up in a blitzing offensive sequence. The problem was Kinsinger crashed inside near the edge and forced a step-out. Later on in the period, Roberts, now understanding of the fact he had to start making something happen, went right at Kinsinger, who dumped Roberts briefly to his back for four points, thus ending the match. Kinsinger will now face the winner of Erik Torba (HUN) and Victor Ciobanu (ROU) in the round-of-16. 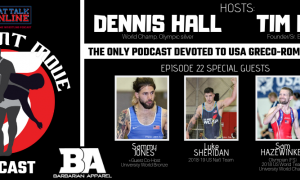 For Roberts to have a chance to content for bronze on Saturday, Kinsinger will have to run the table on Friday and make the finals. 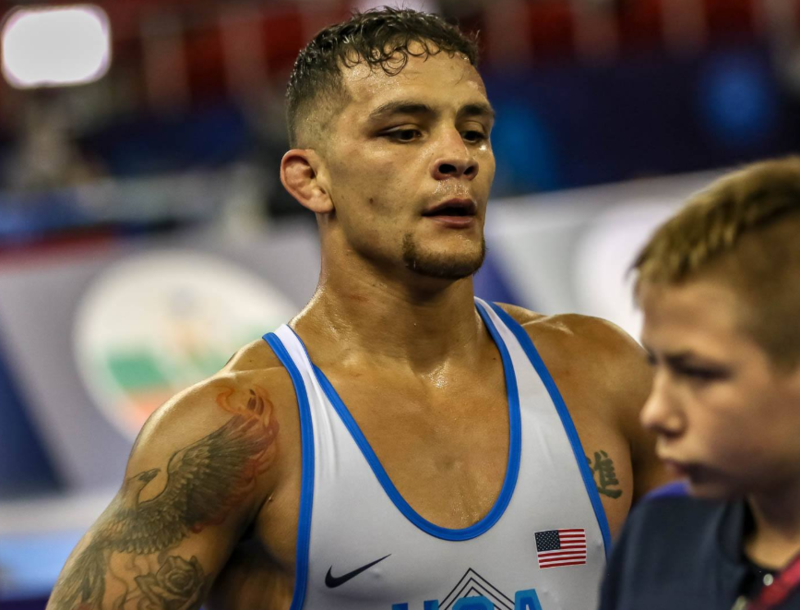 Martinez opened his third World Championships appearance Friday morning with a suitably stiff test in the form of two-time World bronze Viktor Lorincz (HUN, world no. 11). It kept with the script — every US athlete thus far in Budapest has drawn experienced, accomplished opponents for their first-round bouts. Comes with the job description, that’s how you reconcile it. Martinez, a slugger of the highest order, was looking to make this is a fight and went at Lorincz in the tie-ups, weaving in and out as he tried to find position. The tempo seemed to be dictated upon his workrate — but that didn’t mean he wasn’t about to get knocked for passivity and that’s exactly what happened. Lorincz capitalized on a pair of turns to net four additional points and he sailed into the second owning a 5-1 advantage. The conclusive stanza brought forth the same impassioned effort on Martinez’s part that you’d might suspect. He dug in the trenches doing whatever he could force an opening of any sort. Tough sledding in there. Even still, he got his shot from top eventually and achieved his lock. Lorincz remained plastered to the tarp as Martinez’s lock slid and the ref stood them back up with :90 to go in the match. Martinez never relented and dipped levels on a pair of occasions, doggedly fighting for body attacks. Lorincz remained upright, however, and it was he who had his hand raised once the final whistle blew. 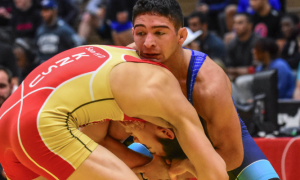 Like Roberts, Martinez needs his vanquisher to make the finals. 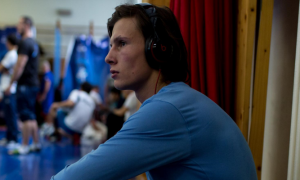 Lorincz next meets up with 2017 World bronze Robert Kobliashvili (world no. 4) in the round-of-16. If Lorincz can advance to the finals, Martinez enters tomorrow’s repechage round. 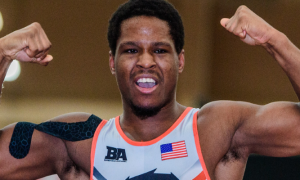 Ellis Coleman (67 kg, Army/WCAP) is still set to go this morning and faces 2014 World bronze Edgaras Venckaitis (LTU). Coleman defeated Venckaitis last year at the Thor Masters Invitational.